If you have a bad credit rating then you’re in the same boat as millions of others in the UK. Many people have found that past financial mistakes – some of them up to six years ago – are hindering their efforts to get loans, credit cards, mobile phone contracts and other forms of credit today. This may be so even though they have run their financial affairs impeccably for the last couple of years. Because there are so many people with bad credit and because the banks are still choking lending almost six years after the financial crisis, there is a thriving market of lenders who are prepared to look at applicants with less-than-perfect credit ratings. A large number of different loans are available for people with poor ratings and a majority of them don’t involve extortionate interest rates, high fees and crippling repayment schedules. 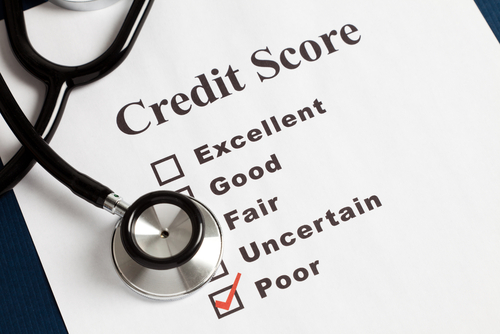 So what are your options when you have a bad credit rating? Even though extortionate interest rates and high fees are the domain of just a few sub-prime lenders, you will still have to pay more if you have a bad credit rating compared with somebody with a perfect financial record. That’s because lenders view you as a higher risk than someone with a good rating. It may be embarrassing or you might feel reluctant, but it’s a good idea to ask a family member to lend you some money if you need funds quickly. You will probably be able to negotiate a reasonable interest rate – or none at all – and a favourable length of time in which to repay it. Your family member may want to write down the terms of the loan and a repayment schedule if you go down this route. There are some lenders who will offer loans to people with bad credit records. While these will come with higher interest rates and, possibly, fees compared with the loans that the high street banks offer to customers, they may offer an affordable way to raise a reasonably substantial sum without having to secure a loan against your property. Different lenders have different eligibility criteria so it’s worth shopping around for a loan as interest rates will differ. If you are rejected by one lender, don’t give up. Some of them also offer pre-application eligibility checks which will allow you to find out if you’re likely to be accepted without a search being registered on your credit record. Many of the major credit card providers now offer credit cards for people with impaired credit. Although these come with higher interest rates, they offer a way for people who have had credit problems in the past to rebuild their credit ratings. Most of them come with relatively low credit limits, though. Other organisations offer credit cards for people with bad credit and these, too, will come with higher interest rates than standard credit cards. If you are a homeowner with bad credit, then your options are greater than if you are a tenant. That’s because lenders are more willing to loan higher sums if they can use your home as security. These loans come with lower interest rates and much longer repayment schedules than with unsecured or personal loans for people with impaired credit records. They are useful for people looking to borrow a more substantial amount of money to fund home improvements, a new car or debt consolidation. The downside to homeowner loans is that should you fail to keep up with the repayments, you could face losing your property. Remember, too, that although they may appear to be attractive because of the lower interest rates and higher sums available, because the repayment schedules are much longer, you could end up repaying a much larger sum than with a shorter-term loan. Credit unions have been growing in popularity in recent years. Owned by their members – in the same way that building societies used to be – they serve the communities that they are based in offering savings accounts and loans to people who live or work there. Most credit unions ask new members to become savers first. This is because the money that they lend out to borrowers is actually financed by the capital they hold on deposit. Some credit unions are now starting to lend out larger amounts – typically up to and beyond £10,000 – while others are offering current accounts for people with poor credit records. Interest rates on borrowing are generally lower than for sub-prime loans. While being distressing and extremely inconvenient, having a bad credit record is by no means a disaster. It is possible, with discipline and planning, to repair your credit record to the point that mainstream lenders might start considering you relatively quickly. You should apply to receive a copy of your credit report from the main credit reference agencies and find out exactly where the problems are. There may be some fairly simple things you can do to fix the problem that you are experiencing – paying off the outstanding balances on cards you rarely use, settling a loan early or cancelling your overdraft, for example – which will have a rapid effect on your credit score. Article provided by Solution Loans, a finance broker with a keen focus on utilising technology to best advise clients of their most suitable type of credit – from their broad range of financial products.